I have a new cookbook to share with you today: Simply Delicious Amish Cooking. What a fun book! It is compiled by a group of Amish who live in Sarasota, Florida, and is full of stories, vignettes, and most importantly–recipes! My piano students are giving a recital tonight, so I gave a couple of recipes a test run for the reception afterward. I wasn’t disappointed! I tried out the recipe for No Bake Cookies, and the recipe for Outrageous Chocolate Chip Cookies. Both are delicious! 1. Cream butters and sugars together. Add vanilla and eggs. 2. Whisk dry ingredients–flour, baking soda, baking powder, salt– in a separate bowl. 3. Combine wet and dry ingredients. 4. 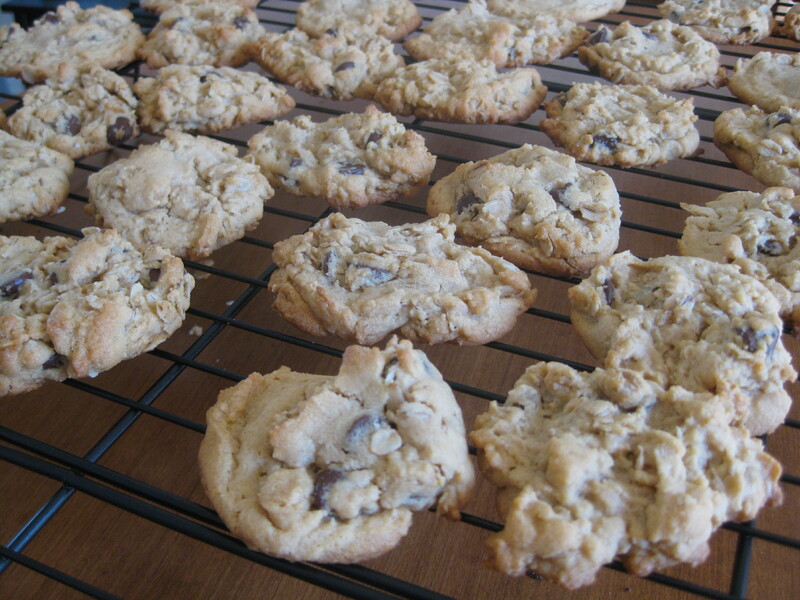 When just combined, fold in oats and chocolate chips. 5. Scoop onto cookie sheet lined with parchment paper. Bake at 350 degrees for 9-11 minutes. This recipe will be sticking around well into my future! The only qualm I have is with the kindle copy of the book–it’s quite difficult to navigate. As kindle doesn’t provide page numbers, the index was unhelpful. In order to find the recipe you want, you need to flip to the proper section, and then go page by page through the section to find your recipe. That said, this cookbook is full of homemade staples, and is sure to be a welcome addition to any kitchen. I think I might need to order a hard copy! Disclaimer: I received a complimentary copy of the kindle edition of Simply Delicious Amish Cooking from Zondervan; however, all of the opinions contained in the post above are my own and were not influenced by Zondervan in any way. Just as an interesting side note about Amish cookbooks. I use tohave one that gave some of the family history and tales in the back. It was noted that the author came from a family of 24 who were so spread out in ages that there was only one time, that the whole family sat down to the same meal at the same time, that being a Christmas Dinner. Wow! That’s a big family. Goodness!